Traditional thermodynamics governs the behaviour of large systems that evolve between states of thermal equilibrium. For these large systems, the mean values of thermodynamic quantities (such as work, heat and entropy) provide a good characterisation of the process. Conversely, there is ever-increasing interest in the thermal behaviour of systems that evolve quickly and far from equilibrium, and that are too small for their behaviour to be well-described by mean values. 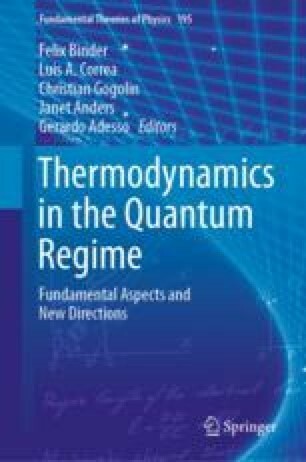 Two major fields of modern thermodynamics seek to tackle such systems: non-equilibrium thermodynamics, and the nascent field of one-shot statistical mechanics. The former provides tools such as fluctuation theorems, whereas the latter applies “one-shot” Rényi entropies to thermal contexts. In this chapter, I provide a gentle introduction to recent research that draws from both fields: the application of one-shot information theory to fluctuation theorems. The author is grateful for discussions, comments and suggestions from Felix Binder, Oscar Dahlsten, Jayne Thompson, Vlatko Vedral, and Nicole Yunger Halpern. The author is financially supported by the Foundational Questions Institute “Physics of the Observer” large grant FQXi-RFP-1614.